good hiring decisions with your team. More than 3800+ fast growing companies use OneRecruit for hiring. When you bring great people together you can achieve great results. Our software helps you to find and recruit them! Track your applicants with ease. Get full view of all communication, notes and resumes in one place. Build searchable talent pools. Set-up and manage job positions & unsolicited application pools for your clients. Create a Branded job site complete with your own styling or add to your own site. Your active jobs will automatically be listed on the site as you add them. Make better hiring decisions as a team. 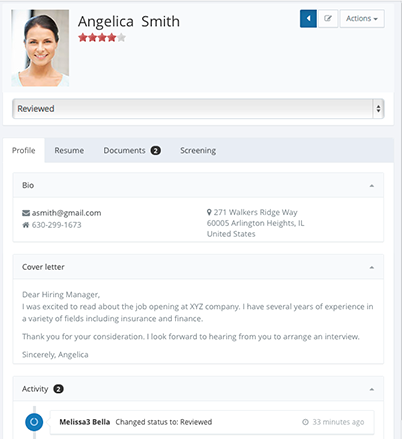 Invite your colleagues or external recruiters to upload, review and screen candidates. Search all resumes and candidates using powerful search engine. No more Excel spreadsheets or post-it notes. Send automatic welcome and reject e-mails based on applicant stages. Much time in hiring is spent on administrative tasks. OneRecruit helps you minimize the time spent on administrative tasks. A solution your team will love using. Keep track of all applicants, resumes, correspondence and feedback notes. Invite your team to help you find the perfect hire.